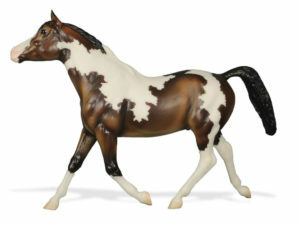 Color me disappointed but I hope some of you love Breyer’s newest reveal! 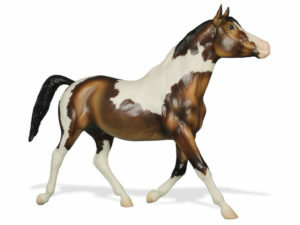 It is the Breyer Brigaderos and he will be the BreyerFest Live Show Overall Reserve Prize model. I personally am not a fan of the mold and am not excited by this particular horse. But let it be said, I am *very* thankful for all the wonderful prizes that Breyer offers at the BreyerFest Open Show each year. The gesture is quite generous 🙂 Unless the glossy sectional prizes are truly something to die for, I’ll be feeling a lot less pressure during the open show this year. And that’s a good thing! As always, good luck to all you entrants! I’m sure there must be some that love the Breyer Brigadeiros and I’ll be cheering for you! Can you believe we have less than 4 months until BreyerFest? It’s past time to start preparing for the BreyerFest Show! Named for a scrumptious Brazilian treat, Brigadeiros is the BreyerFest Live Show Reserve Prize. A delectable bay pinto, this guy is on mold #59, Chris Hess’s Morganglanz originally released in 1980. « BreyerFest 2016 Prize Models & Raffle Models Oh My!